The atm father entry brought out anger and frustration from the readers. 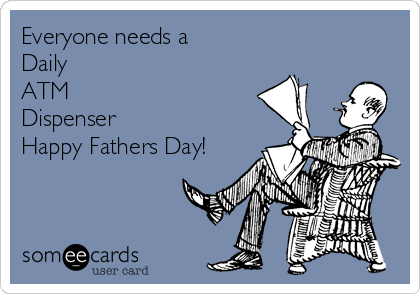 Yes there a lot of atm fathers actually more than we think. Some people blame the justice system because of the divorce terms and conditions. They conclude that the system and the bitterness of divorce led for their fathers to assume the role of atms and not their full parental role. The system treats fathers as nothing more than just financial services. The state makes the fathers look like incompetent parents after the divorce yet the same fathers were very competent and hands on before stuff in the marriage became sour. One man says that they feel hurt and destroyed that they are unable to provide for their kids financially therefor the mother banned him from even seeing the kids. If a man can’t provide financially, does that make him half a man? Really? It breaks the heart of some men that if a specific time comes and they are broke then that means no kids for that broke period. I think that as society we need to rethink the role of abo baba in our lives. Is it fair to say that being an atm dad is not by choice but by the system and the relationship that the parents have and ends sour? Is it because of bitter moms? Comment and open up, lets get yall talking and sharing. This entry was tagged ATM dads, Divorce, Justice. I think it’s a combination of the system that is set up to alienate fathers and dads who take the easy way out of providing money in place of emotional connection.